Divorcing in Missouri? Be Aware Of 7 Common Financial Mistakes. If you find yourself in the middle of a divorce or are in a situation where you are likely faced with a divorce from your spouse, it is important that you recognize that it is your responsibility to take steps to control your financial future and to avoid those common mistakes that divorcing partners commonly make, with often very detrimental consequences. As spouses naturally divide up their individual roles in their marriage, it is all too common for one spouse to lack a working knowledge of the marital finances. This can include a lack of knowledge of the income of their spouse, their regularly recurring household expenses, their banking practices, their retirement or investment accounts and the extent of their marital debt. 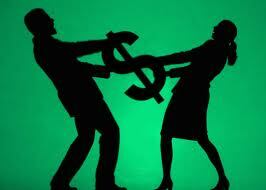 A person in this position is at a significant disadvantage at the outset of the divorce process. This disadvantage can be exacerbated by concern that the spouse who has been managing the finances may be hiding assets or debts. While your attorney can certainly help you to shed light on many of these issues, it is important that the uninformed spouse do what they can to gain knowledge of all of these issues as early in the process as possible. Be aware that it is not uncommon for one spouse to take steps to cut off the other spouse from open access to this information once a divorce is imminent. Therefore, it is important to be proactive. Do what you can to educate yourself on your tax filings, banking practices, investments, and debts. Your attorney will want this information very early in his or her representation of you. By having this information your attorney can get up to speed quicker, and you could potentially mitigate your legal expenses which will come from the necessity of your attorney issuing extensive discovery to make sure that he has a clear financial picture for you. At the start of your divorce process it can be 60 days or more before your attorney is able to get to court with you on a request for temporary support or a temporary order which divides up the responsibility to pay your regularly recurring bills, such as your mortgage, rent and utilities. This process is referred to as a Motion Pendente Lite. If you do not prepare for the possibility that your spouse may take steps to try to limit your access to funds at the beginning of your divorce you, may find yourself in a position where you are struggling to provide for your basic needs very early in the process. With this in mind, it is important that a spouse take the necessary steps which will allow access to sufficient funds during the first couple of months of your divorce. It is common for an attorney to advise his or her client to take steps to protect the interests in the funds in their joint bank accounts or to take steps to insure that they have access to credit that they can draw upon during this time. Early in your communication with your attorney, you should discuss those steps necessary to protect yourself until you can get to court for a temporary support order. If your primary objective in the divorce process is to seek revenge on your spouse, you may do so to the detriment of your finances. For example when a family law practitioner has a client whose primary objective in seeking the acquisition of a particular asset is to deny their spouse that asset; the client may spend more money on its acquisition than it is actually worth without a guarantee that the asset will ultimately be awarded to them. From a legal perspective your family court judge’s objectives in dissolving your marriage are primarily to enter a judgment which creates a custody arrangement which is in the best interest of your children; to enter an order for the support of your children; to enter an order for the support of you or your spouse when appropriate; and to equitably divide your property and debts. You should have a discussion with your attorney about how your spouse’s conduct may impact these decisions. While the conduct of your spouse may play a factor in the division of your property and the award of maintenance, it is only one factor of many that the court must consider in entering its Judgment. By and large the Judge presiding over your divorce will be very familiar with most types of misconduct. Your attorney should be tuned in to how your judge views that conduct but more importantly what, if any, impact the conduct will have on the judge’s decisions on those issues described in the preceding paragraph. Be mindful that your attorney can’t guarantee that your spouse will be responsible for the fees and costs incurred in seeking your objectives in your divorce. If you are pursuing an objective that is not shared by the Judge who is presiding over your divorce, you may be unwisely spending your assets. In certain circumstances, the price of revenge or “justice” in the divorce process can be a significant portion of your marital estate. And, this can have a long term financial impact on your future. Therefore, it is important to communicate with your attorney about the cost-benefits of seeking your objectives in your divorce. In our next blog we will address other financial mistakes including failing to budget for your new expenses and lack of understanding of your retirement assets. If you are in a situation where you are considering divorce in Missouri or have a divorce pending it is important that you speak to a knowledgeable family law attorney about the specific financial ramifications that could affect you.